WP3 Bike-sharing,a challenging and innovative measure seeking to transfer the betterknown principles of car-sharing to bicycles. This WP will be led byBerlin (DB Rent). WP6 Building Local Partnerships will work towards involving local actors in the cycling plans of the municipal authorities. It will be led by Barcelona. The evaluation workpackage (WP7)will analyse and report the project results, highlighting similaritiesand difference samong cities (cross-comparison), barriers and success,drawing conclusions on their transferability. This WP will be led bythe University of Rome (DITS). 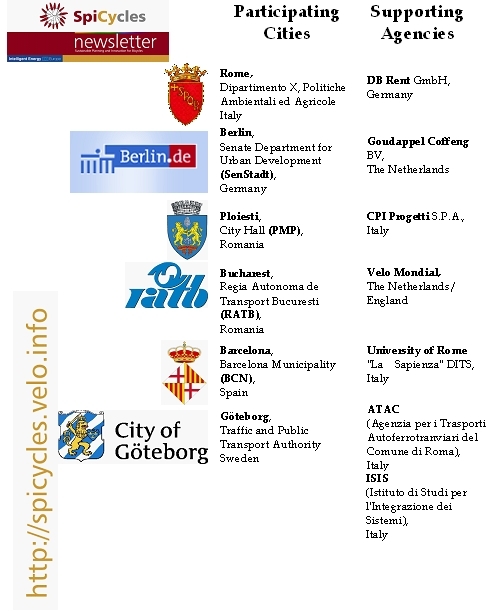 The experiences with different types ofmeasures and the results obtained will be disseminated to a wideaudience of European cities (WP8-WP9).